Oh, Summer! The fruits, the veggies, the gardens! YUM! We don’t have a huge garden but we are growing zucchini and about 4 different kinds of tomatoes and basil and I think jalapenos. I found this recipe on a blog called “Budget Bytes” and it was extremely good. It was gone pretty quickly, that’s usually how I can tell if something is a hit around here. 1 Preheat oven to 400. Finely dice onion and mince garlic. Saute both in skillet with oil until softened, about 5 minutes. 2 While onion and garlic are sauteing, thinly slice all vegetables. 3 Spray 8 x 8″ square baking dish with cooking spray. Spread onion and garlic in bottom of dish. 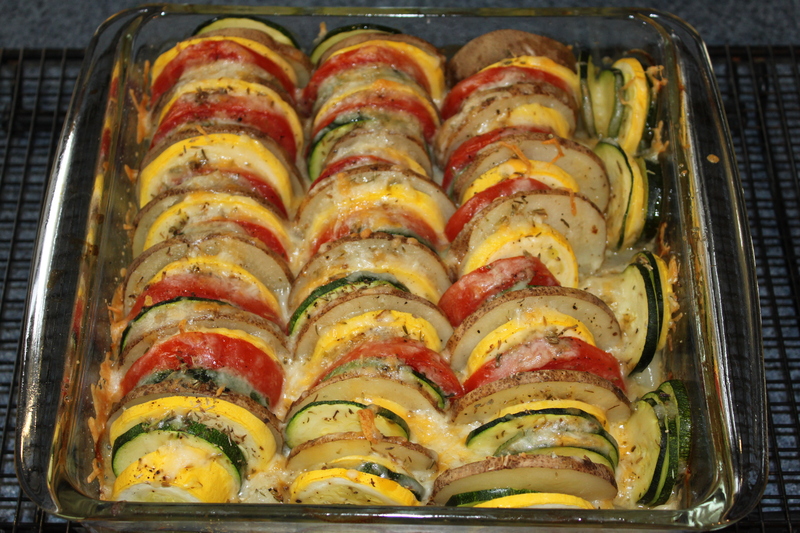 Place veggies vertically in dish, in alternating pattern. Sprinkle with thyme, salt and pepper. 4 Cover dish with foil and bake for 30 minutes. Remove foil, top with cheese and bake another 15 – 20 minutes or until cheese is golden brown. It is delicious, I have made it 2 – 3 times since the first time. Hope you get to feeling better soon!